Islands and atolls of the Marshall Islands. Uninhabited ones are labeled in grey. 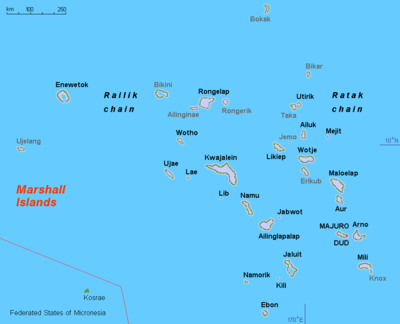 The Republic of Marshall Islands consists of 29 atolls (each made up of many islets) and 5 islands, which can be divided into two island chains, Ralik Chain and Ratak Chain. Administratively, the country is divided into 24 inhabited municipalities, corresponding to the 24 inhabited atolls or islands, where each of them is an electoral district. Most of the Rongelapese community lives since 1985 on the Mejatto Island of Kwajalein Atoll, due to the radioactive contamination of their atoll. The remaining 10 atolls/islands are currently uninhabited. According to the Constitution of the Republic of the Marshall Islands, the uninhabited atolls/islands Narikrik, Erikub, Jemo, Taka, Bikar, Bokak, Rongrik and Ailinginae shall each be included in the electoral district with which it is most closely associated, pursuant to the customary law or any traditional practice. Ujelang is listed with the Enewetak & Ujelang District, and Bikini with the Bikini & Kili District. Geography, Embassy of the Republic of the Marshall Islands, Washington, D.C.